Honouring real South African heroes and here stands an exceptional one. 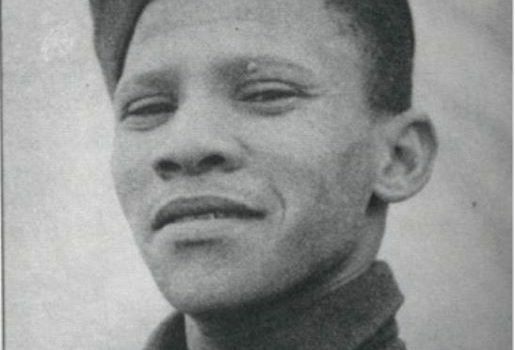 Corporal William Cloete was a Cape Coloured Corps member and the leader of a stretcher bearer team attached to the Cape Town Highlanders regiment in Italy during the Second World War. During a fierce fight with German troops when his company was pinned down on three sides by mortar and machine gun fire, under persistent enemy firing, Cloete and his team carried ten of their own wounded soldiers to safety; for this he received the Military Medal for bravery. Nearly a year later, at the age of 24, Cloete was struck by a bullet from a German sniper and permanently blinded in both eyes. After the war Cloete attended the School for the Blind in Bellville. He became an expert basket-maker for the rest of his working life and passed away in 1993. Your fellow veterans salute you.